What are the products that CDX offers? How do the process and workflow of the operations work? What are the liabilities or responsibilities of CCP on DB? Responsibility of CCP to DB is to provide the approved products for DB to provide to its end clients. CCP is the counter party responsible for providing best available execution, reasonable, and fair prices to DBs’ clients. CCP is responsible for being counter party to DB and its trading transactions. What are the liabilities or responsibilities of DB with Customer and DB with CCP? DB’s responsibility is to safe guarding client funds and adhering to CCP regulation. Providing basic training and service to clients, ensuring clients understand possible market risks and return are also essential responsibilities of DB. In any case if DB failed to margin out client’s money, DB should notify its CCP right away. In case of improper treatment of client’s money and making unrealistic promises or guaranteeing profits to clients, DB’s license is to be reviewed and revoked. With CCP, DB shall at all time, honour agreed settlement terms and conditions. Failing to execute the agreed terms and condition, CCP could terminate all transactions at any given time. What are the risks that may occur and need to be prevented during operation? Any advice for mitigating the risk? Much of the guidelines are available in DB requirements. Much of the operations are around safe guarding client funds and information and Client KYC. 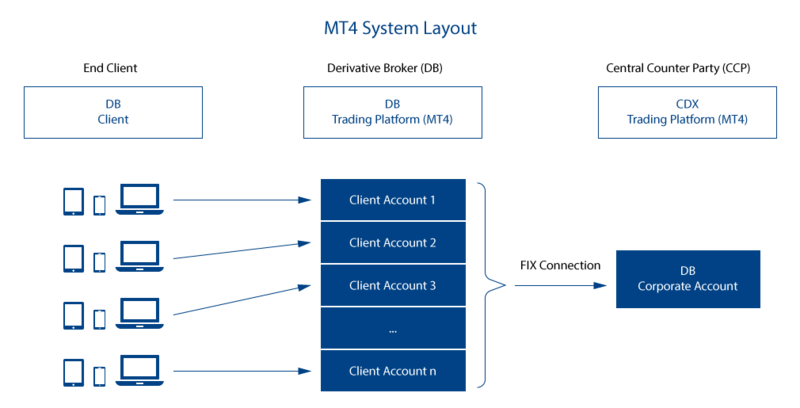 Account opening process for a client in the case of a DB is quite similar to a bank’s account opening process. Never guarantee any profits or trick to obtain client password and churn for excessive trades for the purpose of massive commission. What are the commitment and support of the CDX for the success of as DB? Letter of permit to DB. Assistance of getting DB license. What are the key factors of becoming a strong and successful DB? Know your client, continuous learning and training, strong commitment to this project. Refer to fee break down – much of the larger sum amounts are regulatory requirements such as the $250,000 USD capital requirement with a corresponding security bond at 15% of the firm’s capital. What is the DB-CCP contract period term? Does it need to be renewed ? Please find standard CCP-DB agreement. Contract remains until it cancelled with 30-day notice. In case of terminating the contract due to stop operation, what are the fees that DB can and cannot refund back? Only initial set up fee and other required fees as noted in the CCP-DB agreement. Your funds are secured in a CSA account in one of the three authorized CSA banks. How long does the process take to become an official DB ? From our experience at CDX, it takes around 3-6 months to become regulated DB. When will the DB have to pay the fees and make the deposit ? As soon as DB and CCP begin Liquidity Provider relationship, then the deposit and certain fees will be required.